I was having an awful day yesterday; I got some news that made me sad. 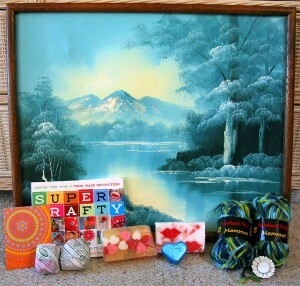 However, when I arrived home, I had the most awesome secret snowflake package waiting on me. This is the best package I have ever received. I’m still glowing; it has made my week. And my secret snowflake is the most awesome one in the entire world! I got a sublimely tacky landscape, an awesome crafty book, lush goodies, handmade soap goodies, beautiful yarn, and a cool vintage pin! I’m so happy to recieve such perfectly chosen gifties! 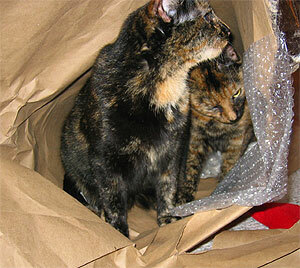 And my cats loved the packaging! That’s Texas & Trixie inside the package!